People ask almost every week about upper arm skin bumps or pimples. You are not alone – it is a common problem. This is a method that may resolve this annoying and sometimes uncomfortable skin condition. First select a gentle, hydrating cleanser or body wash that will aid to soften and cleanse the area. We had impressive results with Renew Body Wash – effective and affordable. Next use a wash cloth or exfoliating cloth/glove with the cleanser or body wash in a circular motion all over the affected area. Some start with the wash cloth, then graduate to an exfoliating fabric – the more sensitive the skin, the gentler the fabric you want to use. First time go gentle on the skin. As you continue to do this daily, you can be more firm. Be sure to rinse the skin thoroughly from any cleanser or body wash. Some find benefit using their facial toner to normalize the pH of the skin to receive the lotion without further irritation. Do not dry the skin – rather immediately apply a nourishing lotion to the wet/damp skin to further hydrate and protect the skin. Within a week or two, you should see the upper arm skin becoming softer and smoother with less upper arm skin bumps & pimples. If the steps above does not get the results desired, we have found applying a pure essential oil like Lavender, Frankincense, or Melaleuca to the skin before step 5. This can take some experimentation on which essential oil or blend of oils will give you best results. Reach out and take advantage of our experience to help with this! Reminder – sensitive skins may need the essential oil to be diluted by a carrier oil like Sweet Almond Oil. Also, be sure you are using a “real” essential oil and not a synthetic! After you have massaged the essential oil in, massage your lotion over to protect and seal moisture in. If these skin bumps & pimples appear elsewhere on the body, the condition may be from acne or sport garments which may improve with the technique above but may benefit from different products. You can use the same general treatment as above but using an acne wash for cleansing the face, back, upper legs or buttocks. Then using the acne astringent to follow the cleansing to remove any cleanser residue and gently exfoliate. Then finish with an oil free moisturizer. Melaleuca oil is an excellent treatment for acneic skin and could be used before the oil free moisturizer. We have had excellent results with the Clarity Line of products – clinically proven results and affordable. Many of you asked – so here I share one of our favorite nutritious recipes using our Turkey Bone Broth. After the bone broth is completed and before making any soups, we fill two old fashioned ice cube trays with the bone broth and put in the freezer. We use these cubes when boiling potatoes, cooking rice or the water when cooking/steaming vegetables! This adds wonderful flavor and loads of nutrition to the meal. 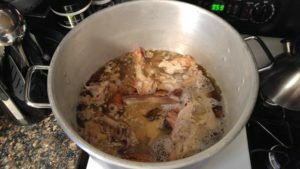 Follow Turkey Bone Broth directions (prior blog post.) After removing the carcass and “cook down veggies”, after making the trays described at the top of this post; I usually divide the broth into 2 pots – half for this turkey bone broth white chili recipe and half for turkey bone broth vegetable soup recipe. Drain the soaked beans. 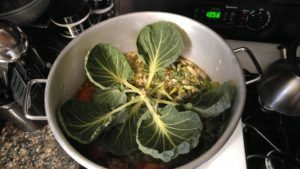 Then cover the beans with the turkey broth – the beans should have 1/3 to ½ more liquid in the pot than beans (liquid to cover additional veggies, and meat.) If you want thicker soup, puree some of the beans with broth to make the soup thicker and creamier. I food process the green chilies, too. Add the processed parsley, carrots, celery and any other veggies you want to the soup (my family prefers just the carrots and celery.) Cook them to the almost desired doneness. Add the reserved turkey meat and seasonings. Cook for a few minutes to let the flavors brew. Taste and add more seasoning if needed – lately I have been adding in some powdered garlic. This dish always seems to taste best after a day of rest in the refrigerator. Making this soup is a 2 day process for me – bone broth and soak beans on the first day. Then making the soup and storing on the second day. Thanks to a few friends, our soup making skills have moved up a few notches in our home. Grateful for the experience and generosity of my friend Tiffany Hinton, GF Mom Certified. Tiffany has been a valuable health coach and resource for our family. She has introduced me to the world where “food is medicine”. Particularly grateful for learning about Dr. Terry Wahls. I found Dr. Wahls book easy to read and have applied her wisdom to the way we shop and cook for our family’s health. As a result, it’s not just great soup! We make incredibly nourishing, healing bone broth soups. 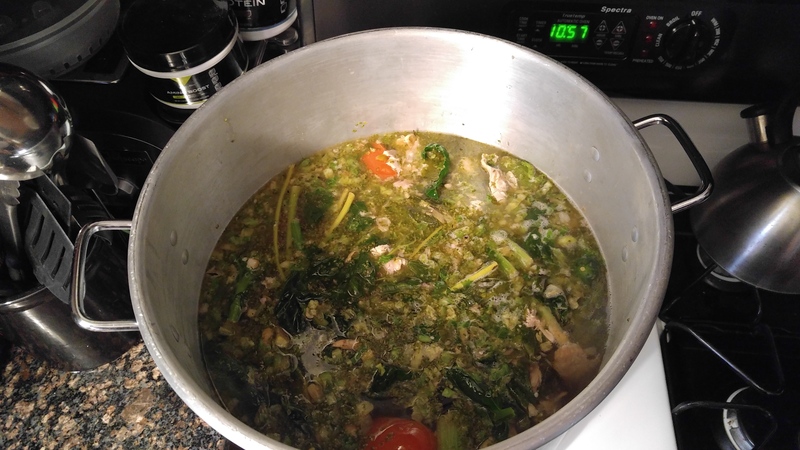 Bone broth soups help reduce inflammation – an important every day therapy! This tutorial is for our “after Thanksgiving” Turkey Bone Broth Soup. Being an artist – I enjoy instructions so much more if there is a visual to go along. Therefore, photos have been taken at each step of this cooking adventure. Thanksgiving day we smoked a turkey, baked a turkey and grilled a turkey breast (with the bones of course!) 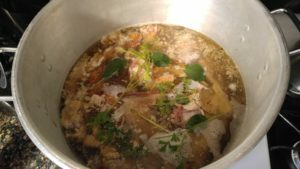 In this photo you will see the start of our Turkey Bone Broth. Here are the three carcasses covered by filtered water. My husband, Kris, installed a grow light by our sliding glass doors. Therefore, we are able to continue to have herbs, greens and tomatoes growing indoors. From this garden, I have added freshly picked organic parsley, thyme, sage along with some chopped garlic, sea salt and organic pepper to the pot. Whenever possible, we invest in organic produce. If I see any starting to go soft, where it may not be enjoyed fresh anymore, I place in a freezer bag. In addition, I have collected stems, leaves and even the roots of some of the organic plants we had in our outdoor garden this summer before it got cold and froze them. I use these vegetables in the “cook down” of the carcasses. We add these vegetable right away to enhance the flavor of the remaining meat on the bones. 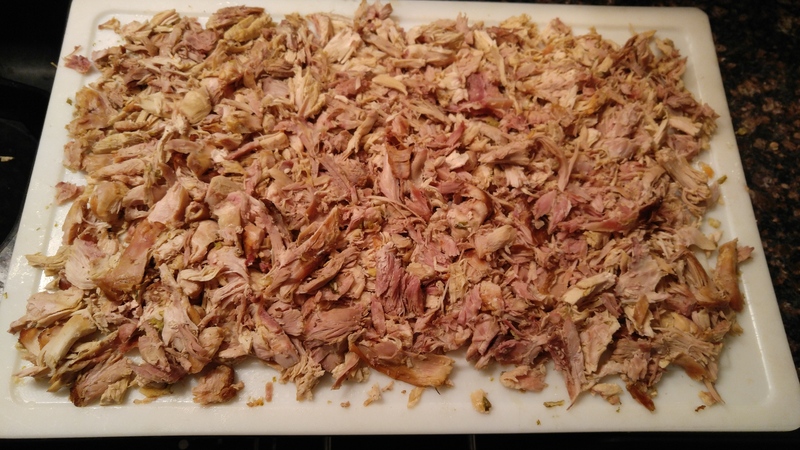 Some may prefer to wait till after the meat is collected (after 2 hours of cooking) which does make the process easier. We feel the flavor and nutrition added to the meat, is worth the extra work later when collecting the meat. Let everything cook for about two hours. At two hours the meat should be starting to fall off the bone. Time to use tongs to grab the carcasses, loose meat and bones to glean the usable meat. I have a plate to collect the cook down veggies, cartilage, skin and bones that will go back into the soup pot to continue cooking for an additional 8 hours. 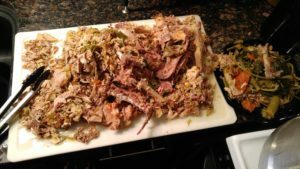 Most people don’t realize how much meat they throw away with the carcass! Look at all the meat recovered from the turkey carcasses! Place the recovered usable meat (I do not like any fat or chewy meat in my soup!) in a container in the refrigerator to add to the completed soups tomorrow. All scraps, cartilage, bones and cook down veggies go back into the developing broth to cook down for another eight hours. I personally do not cook longer. 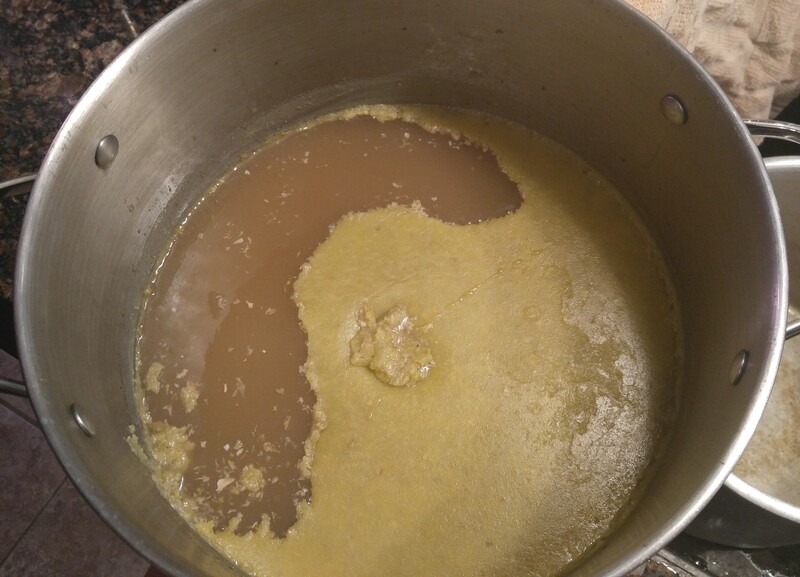 The broth gets a unique smell after cooking twelve hours. So we stop around ten hours. We love the taste, smell and nutrition after 10 hours of cooking! 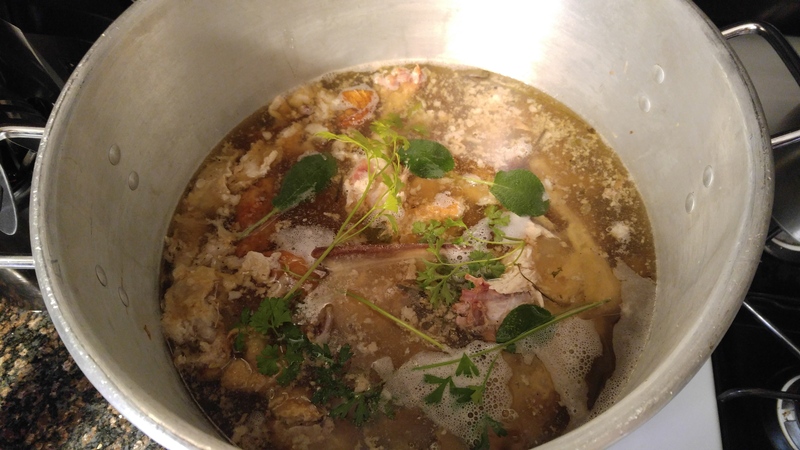 Finally, after the eight hours (ten hours total) of cooking has passed, we will prepare to get the wonderful bone broth. You may wish to let the hot pot cool for a bit. Place an empty large pot in the sink with a colander on top. 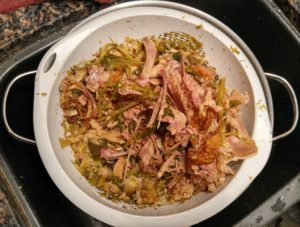 Then pour the contents through the strainer – the remaining bones, meat and vegetable parts will be caught by the colander with the nutrient dense bone broth going through into the pot. 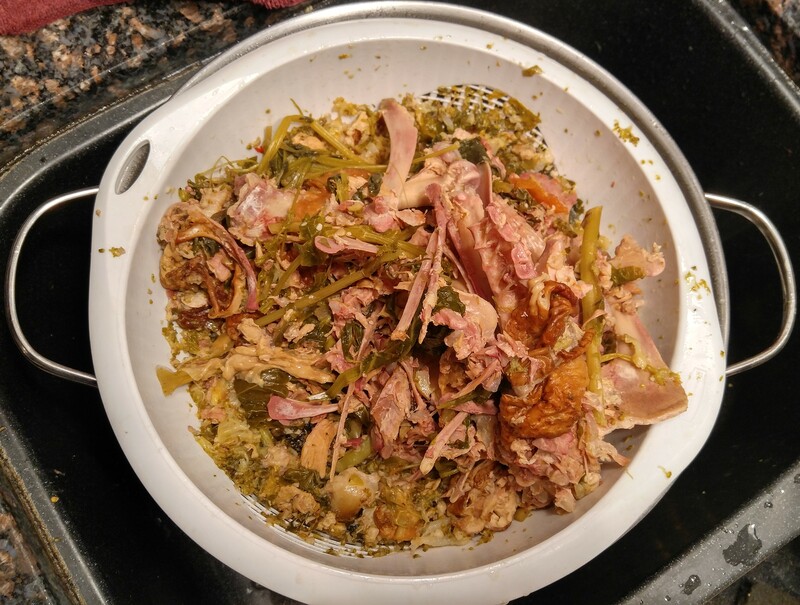 Throw the bones and leftover meat and veggies away in a safe container that animals cannot get into. 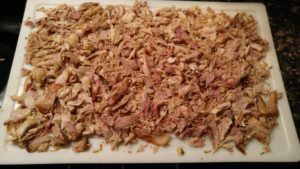 Poultry bones are very dangerous to pets and wild animals! Refrigerate the pot of bone broth overnight. Most broths when refrigerated get a layer of heavy fat at the top – it is especially thick with turkey bone broth. I remove most of this really goopy fat from the broth before continuing. This turkey bone broth is ready to use for sauces, gravies, cooking vegetables, potatoes, rice or making soups. I made 2 different soups from this pot of broth plus a tray of cubes to use for cooking veggies, potatoes, etc. to boost nutrition! The first soup was a turkey white chili and the second was turkey vegetable! My family raved about both – they keep getting tastier and more nutritious every year! My goal is to have at least a cup of bone broth soup every day! So nourishing and I can really feel the benefits! 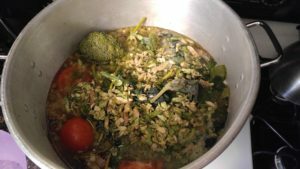 Let me know what you think of this tutorial….happy to share the soup recipes with you! Let’s connect if we haven’t already! Send us an email at elizabeth@yourcomfortforlife.com or call/text at (847) 502-8394. Elizabeth & Kris Gronert bringing you Comfort For Life! Thank You Schaumburg GFAF Expo! Lots of gluten free food was donated to the Willow Creek Care Center along with fresh fruits, vegetables and a wheelbarrow full of sweets – a display from Swerve! Mr. Price shared with us that there is a waiting list for those with food allergies or are medically required to be gluten free. 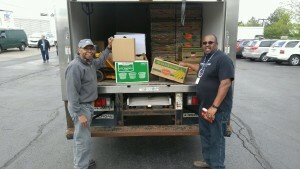 They were excited to contact the people who will be blessed by this donation. Thanks again to everyone for working so hard after a long 3 day event to benefit people in our community! 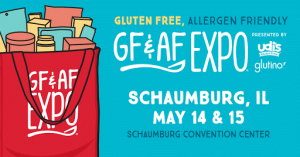 Please contact us if you would like more information regarding the Care Center at Willow Creek Church, Willow Creek Community Church or learn more about being gluten free, allergen free, the Schaumburg GFAF Expo or any of the Gluten Free Allergy Free Expos. Like this post, send us an email at elizabeth@yourcomfortforlife.com or call/text at (847) 502-8394. Elizabeth & Kris Gronert bringing you Comfort For Life! Glowing, Nourished Skin Even When Cold and Dry Out! Use only safe, non-toxic, non-carcinogenic products on your body. Unfortunately, many retail products still contain hazardous ingredients because they are cost effective. An example would be quaternium-15 which is a formaldehyde releaser and reliable preservative. It is in many popular products (was in a famous line of Baby Products till 2015!) but is a known carcinogen! 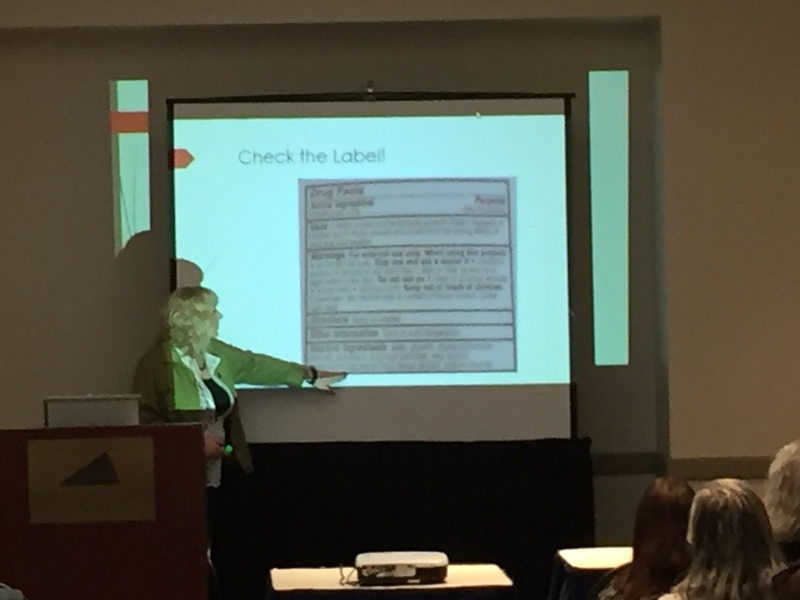 Check your product labels! Just because it is expensive or a “brand name” does not mean it is the best or safe. I know the air is colder but try not to raise the temperature of the water you use in the bath or shower. The hotter the water, the more it dries out your skin! Another option for exfoliation are some of the wonderful salt, sugar and blend scrubs available. I prefer to use these products in the bath so the wonderful, healing ingredients can absorb nicely into the skin after your scrub. Really wonderful if you can find a kind soul to scrub your back too! 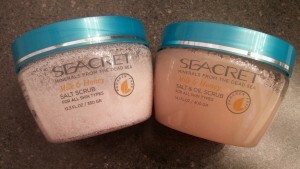 Currently my two favorites are made by Seacret. The Dead Sea Salt is an excellent exfoliators with healing benefits. The Milk & Honey has essential oils that leave skin dewy after the salt polish. 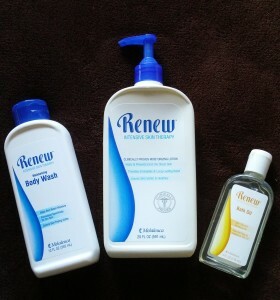 The Renew product line is made by one of my favorite online stores. These products are daily miracle workers – specifically formulated to nourish and help keep skin from drying out while bathing. Guys and gals love this product line because it outperforms doctor recommended Eucerin, absorbs well into the skin and has gentle, healing Melaleuca (tea tree) oil. No girly fragrance for the guys, gentle and safe for babies! Turn your bath into soothing skin therapy by adding a capful of hydrating, calming bath oil. Add some Epsom salts for a healthy body detox plus the added magnesium and sulfur! After your bath and shower, best to let yourself air dry and apply your lotion while your skin is still moist. Be sure to use a moisturizer with a protectant so you don’t lose all the moisture in your skin back into the air. During the really cold or dry months, add your favorite essential oils, almond oil or other oils to boost the healing and sealing power! Lots of evidence that a relaxing bath, helps one have a good night’s sleep – proper sleep helps the skin look and feel it’s best too! Using these tips your skin will be polished and nourished – ready for the cold and dry season. With skin being your largest organ, consider using these tips year round to keep it healthy and protecting you at peak performance. Cracked Heels Treatment that Works! Are cracked, tender heels a problem for you or someone you love? Here are a few quick tips that successfully have helped others treat the cracked skin on heels. The cracked, dried skin took time to develop and it will take diligent discipline to nourish the heel skin back to supple health. If the cracks on the heel are open or bleeding, priority must be to help them heal. If there are medical conditions like Diabetes, please consult your medical professional first regarding any broken skin on your feet! Only use products that are toxin & carcinogen free . Be sure to avoid any allergens and gluten if you or the person you are caring for are sensitive! Apply an antibacterial & antifungal healing ointment to the areas that are affected until healed. Sometimes, soaking the feet in a gentle, non-detergent bath with Epsom salts and bath oil will aid in healing the skin. 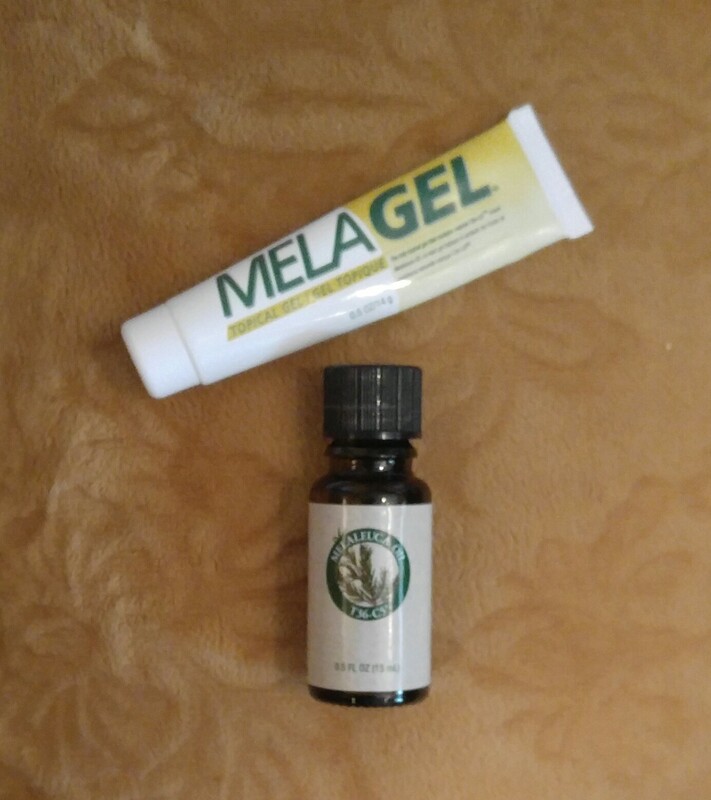 We have had excellent results with a product from one of our favorite stores called MelaGel – however, it contains wheat germ oil and is not gluten free. Using a pure Melaleuca essential oil also works well under lotion or ointment. Melaleuca oil is a natural anti-inflammatory with antibacterial, antifungal qualities. It is also a natural antihistamine to reduce any swelling and redness. Apply the MelaGel or Melaleuca oil with a protecting lotion/cream/oil to the areas needing healing and cover with a white or undyed sock. Apply twice daily to speed healing. Once the open cracks have healed, we can now work to improve the skin tissue of the heel. Soak the feet in a tub with a soothing non-detergent bath oil – add essential oils (Melaleuca, Lavender, Frankinsense are great ones to try!) 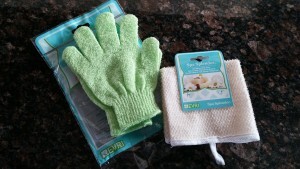 and Epsom salts for added benefit. Once the skin has softened, follow the directions below the picture to gently exfoliate the heel using a pedicure paddle. Our favorite is Swedish Clover Föt File imported by Flowery. This paddle has a coarser side (raised nubs) and a smoothing side (horizontal lines). Depending on the thickness of the skin (as we mature the skin thins so be careful to stay on the thick bottom skin of the foot – usually has a yellowish tint.) Do not use this paddle on someone with diabetes or other medical condition without consulting your medical professional first! For most people, you can start with the coarser side to gently rub the thick skin of the heel (some have this this thick skin on the ball of the foot and big toe) to thin this heavy pad – when it is very thick, it wants to crack. By reducing the thickness, the skin is able to be more pliable. Be sure to stay on the thick padded parts of the heel, ball of foot or big toe at all times. Focus on the areas that want to crack. Never remove too much skin – the body creates this callous to protect the foot. Start by just a few swipes to soften, then finish by using the smoothing side of the paddle to bring the skin to an even appearance. Always use the smooth side to finish otherwise the body may work quickly to replace this unhealthy thick skin. 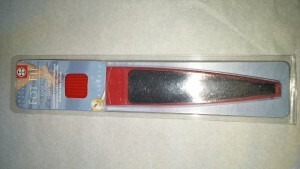 We suggest keeping the paddle in the shower/bath and use 1-2 times a week for maintenance. Rinse the feet. While skin is till moist apply ointment, MelaGel or Melaleuca oil to the spots that tend to crack. Then massage the whole foot with lotion/cream. Depending on the lotion/cream you use, an application of oil may be required as a prevent moisture loss. This will help the skin heal and regain its pliable, healthy state. Application of the products after every bath and shower is suggested to retain the moisture in the skin to eliminate cracked heels forever. If you found this helpful, please let us know. Just a reminder, if you have any medical condition – please consult them before trying any of our suggested treatments. In this article, we are sharing over three decades of success/experience as a cosmetologist/esthetician. Visit us on Facebook (Elizabeth Anthony Gronert), send us an email at elizabeth@yourcomfortforlife.com or call/text at (847) 502-8394. Elizabeth & Kris Gronert bringing you Comfort For Life! Are you dosing your baby and family with toxins? Talk about education – these last 3 years I have learned so much about what is in our everyday products and the possible repercussions. Being a single mom, it was hard to afford what I thought were the “finest” baby products but did it to take the best care I could for my son. How disappointing to find out years later that all those baby products had contained quaternium 15…a preservative that is a formaldehyde releaser. This preservative does an excellent job preserving products for long periods of time which is important because large quantities of these products are manufactured and bottled – sometimes outside of the USA – then they sit in a warehouse for months, maybe years before they ever see a store shelf. Not only is quaternium 15 toxic, it is a known carcinogen. Unfortunately, my son has been regularly dosed with formaldehyde most of his life. First by me with the baby products, then continued since many brands of toothpaste, mouthwash, deodorant, body wash, body lotion, skin treatments, hair shampoo, hair gels, fragrance contain formaldehyde as the preservative. Are you dosing your baby and family with toxins? Life is busy and for many this just doesn’t seem like a “too” important issue. And for some, it may never impact your life. Your health may always be “good” enough that you don’t realize how much better you might feel every day if you rid yourself of these toxins. But for many people we work with who have sensitivities, auto-immune disease, allergies or are just plain educated – they know that formaldehyde and whole slew of other toxins, poisons and carcinogens are in most products in the grocery store. They have learned to read labels and know what to avoid. Your skin is your largest organ and it is very effective at absorbing what is placed on it or is in the air around it. It is disturbing when I meet with moms and they share that they know they should be concerned about what is in the products they bring into their home for their family but it just doesn’t worry them at the moment. So tragic when they contact me months or years later when a family member is diagnosed with ADD, ADHD, autism, allergies, asthma, autoimmune disease or even cancer. Priorities change real quick then. It’s even more challenging when I meet pregnant moms who are very careful about what they put in their mouths. But unreceptive to thinking about the everyday products they are using and the impact that these products may be having on their unborn baby. Once the baby is born they are very selective about laundry detergent, baby care products and would never use toxic cleaners around their babies. However, while they are pregnant, they continue to use their laundry detergents with toxins and carcinogenic preservatives….which leave residues in their clothing/bedding/towels that their skin absorbs, especially when they perspire. They use body washes, lotions, deodorants, hair products, toothpaste, mouthwash, cosmetics on their bodies which absorb the toxins within 24 seconds into their bloodstream which is their baby’s bloodstream. They continue to use the poisonous cleaning products around their home which they breathe in and absorb through their skin. So they are diligent about what they place into their mouths but seem to think everthing else they use or come into contact with has no impact. So please, think just for a moment – are you dosing your baby or your family with unnecessary toxins, poisons and carcinogens with the every day products that you use? You do have options…and believe it or not, these options will likely save you money over the store you are shopping at right now. If you found this helpful, please let us know. Send us an email at elizabeth@yourcomfortforlife.com or call/text at (847) 502-8394. Elizabeth & Kris Gronert bringing you Comfort For Life! Life has been a whirlwind of meeting new people, savoring time with friends, sharing valuable information and tools! Spent this last weekend in Atlanta with our friends, the Domanicos, while attending the Gluten Free Allergy Free Expo at the Cobb Galleria. I love these events – I always come away with lots of new knowledge plus contentment knowing I have served people by helping them connect with valuable and money-saving resources! Wear layers of comfortable clothing. Temperatures can run the gamut – some places are hot outside and inside – so have layers that you can easily remove and stow in a tote. Even when it is cold outside, it can be brutally warm inside. I found this true when I was in Texas a few months ago. They are not used to cold or icy weather, so the heat in the hall was high to accommodate the locals but about boiled this Chicago, menopausal girl! Then half way through the show, the hall became cold since many complained about the heat and I had to go find a jacket…. The reverse can be true – brutal hot outside and a refrigerator in the hall inside… so be prepared by wearing layers. Comfy, supportive shoes ideally with a sock or liner to protect skin – an emphasis on supportive – you have only two feet to make it through your whole life. Take care of them with shoes that are not only comfortable but have support built in to preserve the integrity and health of your foot. Socks prevent blisters and uncomfortable chafing. I have learned that when I have to stand or walk for long periods it helps to have a second pair of shoes to change into. I know this sounds like a pain but when my feet hurt, I hurt all over! You need high protein snacks and a baggie of veggies/fruit. There are usually lots of carbs to taste at the gluten and allergy free expos so your body will be craving protein and national fibers for balance;-) Bringing a water bottle you can refill is a good idea. 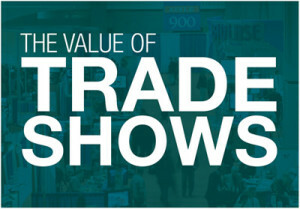 Most of the trade shows I have attended have limited if any access to a snack bar or concessions. Be prepared to wait in lines – I encourage you to bring and use your strollers, wheel chair, walker or cane-seat. You will have the opportunity to purchase “deals” from some of the vendors and many give out samples, coupons, magazines, etc. Bring a couple reusable tote bags that you can pull out as you accumulate goodies. Some who have challenges carrying may want to bring a rolling bag or suitcase to stow things instead of lugging them around on your shoulder. If you are local and can carry a lot of things home, plan to be at the expo at the end of the last day and have bags to fill. Many vendors will give away display product because too expensive to ship back home. Attend the speakers’ presentations. You will learn so much from those who have traveled the path you are on – useful information for your journey or valuable information to share with someone you care about. Plus you get to know the speaker/author/blogger and will find the ones you want to sign up for their emails/blogs or purchase their books. Bathe as usual but skip fragrance please. Many who attend have severe allergies and your favorite perfume or bath spray could ruin their whole day or week. Really VISIT each booth and talk to the people that are there. Most of us have a story to share that may help you along your path. Some booths are there just to “sell” or are a bigger manufacturer that has “hired” help with no knowledge of our industry….but if you take the time (and full advantage of your ticket price) to look each person you meet in the eye, most of the people that have traveled to this expo have a lot to offer you and you will be much richer for taking the time to find it…and have many more friends/resources to reach out to when you have questions or need help. Get on the email lists for the people and events that resonate with you. Most will offer early bird ticket savings. 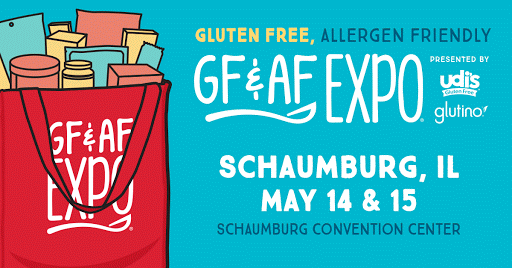 Get a FREE One Year Subscription per Household to Delight Gluten Free Magazine ($24) with Online Ticket Purchase for the Schaumburg GFAF Expo May 2-3 (there is a fee.) You will be contacted by Delight one week after the event to start receiving your subscription. Tickets are non-refundable. If you found this helpful, please let me know. Send me an email to elizabeth@yourcomfortforlife.com or call/text at (847) 502-8394. Elizabeth & Kris Gronert bringing you Comfort For Life!